"This rich, velvet and luxurious butter will, sure, be your ultimate favorite entire body treatment. It contains 20+ elasticity boosting essential oils and extracts. Having lesser amount of our signature rare Caviar Extract it still gives your skin plenty of tender care, vitamins and minerals and essential Omega fatty acids. It's rich in lycopene, carotenoids, essential fatty acids Omega 3, 6 and 9, beta carotene., manganese, proteins, Vitamins E, C, F, B1, B2, B6, B12, D, & K. High linoleic and linolenic acid content. It boosts levels of collagen and elastin to promote the skin's elasticity and suppleness, strength and firmness. Unique formula increases circulation, cell hydration, repairs and tones the skin. Some rare ingredients, such as Caviar (Roe) Extract is very rich in vitamins A, D, B1, B2, B6 and micro-elements Co, Cu, P, Si, Zn as well as amino acids like glycine, lysine, histidine, arginine, asparagine. Those ingredients intensify the processes inside the skin cells and at the same time slow down the degradation process. Caviar Extracts (or Roe Extract) are a source of vitamins, nucleic acids, phospholipids and proteins. They are in themselves a source of marine DNA, a key element to skin cell regeneration." 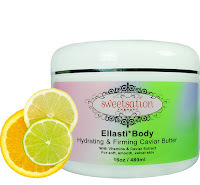 I was sent a 16.0 oz jar of the Ellasti*Body Hydrating & Firming Caviar Butter from Sweetsation Therapy to review. The price for this bottle is $49.00, plus shipping. This jar arrived to me in perfect condition. There was not any damage, defects, nor issues during shipment. This is a big jar. It stands approximately 3.5" tall. It is 4.25" in diameter. The jar itself is very pretty, the label displays a nice pink to green gradation. The jar is white, and it has a white screw-on top. There is a chrome accent on the lid as well. It was wrapped in tissue paper when I received it. The front of the jar labels the brand, product, and sizing information. It also lists the main ingredients-- vitamins and caviar extract. The back label is where you will find all of the important information about this product. It explains how to apply it, associated warnings with its use, a list of ingredients, and company contact information. This is not tested on animals and boasts a full 24-month PAO (although you are going to love this, so I don't see it even going that far!). When you open up the jar, you will find one of those plastic 'dust covers'. I keep these on my jars to keep the light and dust out when I'm using this. There is also a little spatula/scoop to grab some of the butter to use. It sits right on top, so you can keep it stored there if you wish. You know, it's really hard to come across a good body butter. Believe me-- I have tried. I had the tropical one that I reviewed about a month ago, and that was really nice, but I ran out of it. I was so excited to try this one, because let me tell you-- Sweetsation Therapy makes some awesome products. I told you a little while ago that I am only going to review skin care items that are not out to make a quick buck off of you. You can definitely tell. You can look at the label here and compare it to something that is a little more 'pushed-in-your-face' and see the immediate quality difference. Now, the real test comes when you actually try it. This body butter isn't super thick, but it does provide a nice and thorough coat. The fragrance? Oh, boy. It's a-m-a-z-i-n-g. It's very citrus-y and uplifting. I just love it. The spatula makes it easy to grab a decent amount without contaminating the remaining body butter in the jar. I recommend using this immediately after a hot shower while your skin is at its peak moisture level. This captures that, and keeps your skin looking and feeling super soft and hydrated. Contains super awesome organic ingredients. I'm digging the spatula-- no more contamination. Captures your body's peak moisture levels. I haven't found any cons of this body butter. I have been using this for a while now, and it's very rare that I look forward to using a body butter. If you know a lot about them, they typically are found in a jar, and jars aren't my favorite. BUT, Sweetsation Therapy gives you a little application spatula to keep your hands out of the product which is my primary concern in the first place. This smells excellent, and really gives your skin a nice 'wake-up' and rejuvenating finish. Keep dry spots like your knees, elbows, feet, and hands looking refreshed! Back in the day I thought that The Body Shop made some pretty good body butter. Not anymore. That is entirely overpriced for the quality. While this may be a higher price than you may feel comfortable with, the ingredients speak for themselves. I can't say this enough-- you get what you pay for. This is an amazing formulation that will do wonders for your skin. You definitely need to try it. 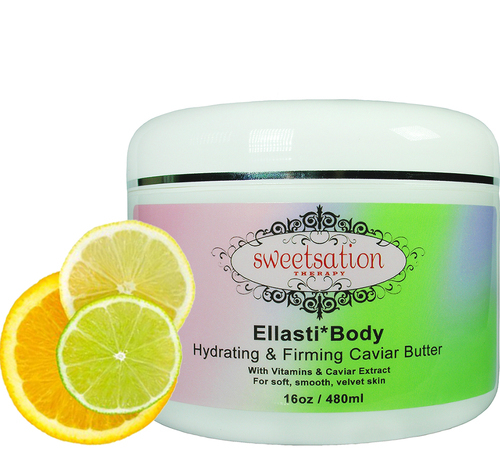 Are you wanting to try the Sweetsation Therapy Ellasti*Body Hydrating & Firming Caviar Butter, too? Click the link below, and order away! So happy that you loved it :) Thank you!!! !